<p /> <a href="http://www.ecouterre.com/toms-unveils-new-one-for-one-eyewear-collection/">TOMS</a> has scored another high-profile collaboration, this time with <em><a href="http://www.glamourmagazine.com">Glamour</a></em> for its annual <a href="http://www.glamour.com/fashion/blogs/slaves-to-fashion/2011/12/toms-glamour-and-our-favorite.html">"Fashion Gives Back"</a> initiative, the ladymag's sixth. To fete its three limited-edition styles, the newsstand staple recruited five of the world's top professional clotheshorses—including <a href="http://www.ecouterre.com/toms-gets-glamour-treatment-with-model-studded-magazine-feature/glamour-toms-2/?extend=1">the granddaughter</a> of silver-screen legend Ingrid Bergman—to model the do-gooding kicks for its January 2012 issue. In addition to TOMS' policy of donating a pair of shoes for every one purchased, TOMS and <em>Glamour</em> will each contribute $2.50 per sale to benefit the models' favorite humanitarian causes, which range from providing <a href="http://www.ecouterre.com/toms-charity-water-launch-limited-edition-shoes-to-provide-clean-water/">clean water</a> to rural communities in need to rehabilitating victims of Japan's devastating <a href="http://www.ecouterre.com/pact-for-japan-architecture-for-humanity/">tsunami and earthquake</a> in March. <p /> Elettra Wiedemann for <a href="http://onefrickinday.org/">One Frickin Day,</a> an organization that motivates individuals to give a day's worth of salary or time to charitable projects around the world. 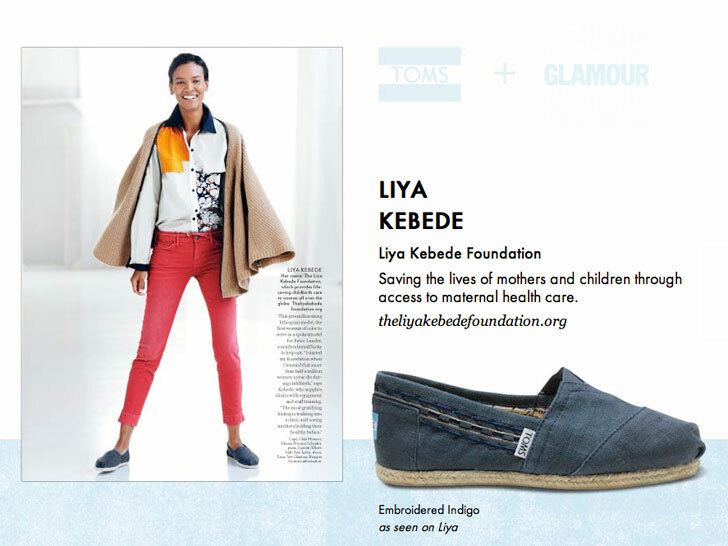 <p /> Liya Kebede for the <a href="http://www.theliyakebedefoundation.org/">Liya Kebede Foundation,</a> which saves the lives of mothers and children through access to maternal healthcare. <p /> Tao Okamoto for <a href="http://www.peace-winds.org/en/">Peace Winds Japan,</a> a nonprofit that helps rehabilitate victims of natural disasters. 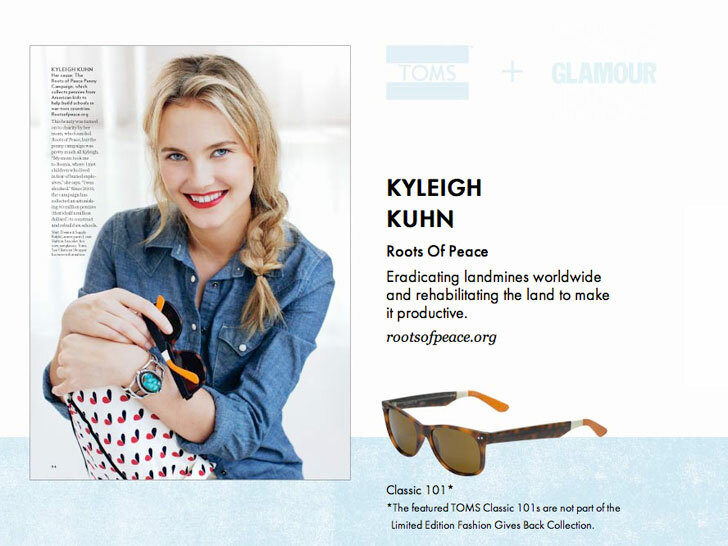 <p /> Kyleigh Kuhn for the <a href="http://www.rootsofpeace.org/programs/penny-campaign/">Roots of Peace Penny Campaign,</a> which collects pennies from American kids to build schools in wartorn countries. <p /> Amber Valletta for <a href="http://www.ecouterre.com/kwiat-teams-up-with-charity-water-on-lifesaving-diamond-bracelet/">Charity: Water,</a> a nonprofit that supplies clean and safe drinking water to people in developing nations. 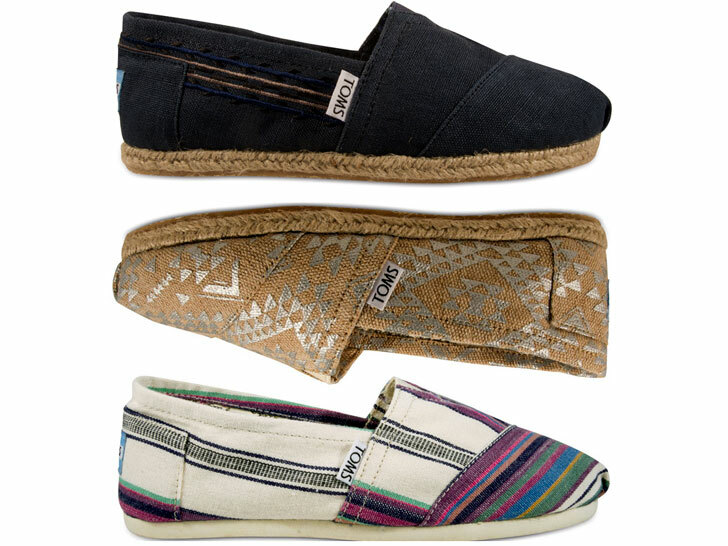 <p /> The limited-edition <a href="http://www.toms.com/fashiongivesback">Glamour x TOMS</a> "Fashion Gives Back" collection—only 23,000 pairs are available.